Earn up to 1,096 reward points. 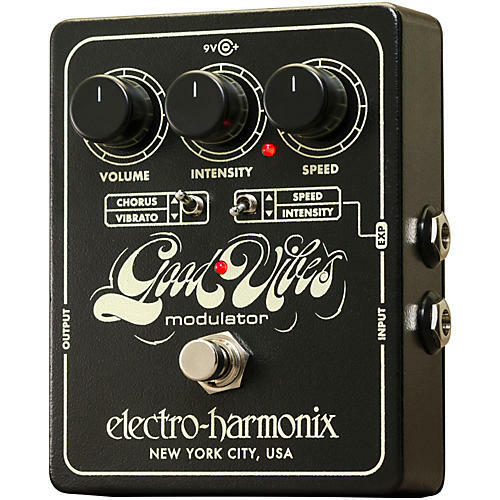 Selectable chorus or vibrato effects pedal delivers classic 1960s tone and vibe. The Good Vibes recaptures the iconic chorus/vibrato effect of the 1960s in an updated pedal with features designed to meet the needs of the modern player. Like the original Uni-Vibe, it uses photocells to create chorus and vibrato with a warm, undulating, liquid groove for a sound and response thats true to the classic design. Boosted power rails provide 21st century definition and headroom, and an expression pedal input puts free-form control for speed or intensity at your feet. True bypass, too. Order this killer pedal today!